Whether you’re just starting out or you’re already a seasoned runner, one of the most important pieces of sport equipment you’ll need is the right running shoe. Finding the perfect running shoe for your running style and body type is crucial to ensure you’ll have success in running and avoid injury. Luke Paulson, a seasoned runner and employee at Jus’ Running in Asheville, NC, does a great job with customers when they walk through the door looking for the right shoe for running and/or walking. Don’t let the beard and laid-back-runner attitude fool you: Luke is serious when it comes to proper running shoes. Your body type is an important factor when deciding on which running shoe to purchase. If you tend to be on the heavier or taller side, you’ll hit the ground with more impact; therefore a higher cushion shoe is advisable. Stability shoes provide more structure and stability around the upper part of the shoe/ankle area, and they provide more support for your arches. For those on the lighter side and looking to speed up, look for less cushion – something that is more responsive. Responsive shoes tend to have less cushion and less material in the upper part of the shoe/ankle area for a lighter, faster feel. Most shoe stores will have plenty of good options for these types of runners. If you really want to geek out, some responsive shoes have a low heel/toe drop, meaning the heel is elevated above the toe area of the shoe. Heel-to-toe drop is a measurement that is closely related to cushioning height, ranging from 0mm to more than 12mm. Heel-to-toe drop is the difference between the height at the heel and the height at the forefoot. ~ Barefoot shoes have a 0mm drop. ~ Moderate and maximalist shoes offer a wide range of heel-to-toe drops. Jus’ Running carries a 12mm as its highest heel drop (also referred to as a heel rise). A larger heel drop encourages runners and walkers to land on their heels more. A lower drop will encourage them to land more mid- to forefoot. The result offers more muscle engagement and balance. It’s not for everyone though and takes time to get used to, so make sure it’s the right fit for you. A good way to figure out what works best for you is to bring in your old running shoes and match the drop – or, look at your other athletic shoes. Even your casual shoes can give you a clue. Wide feet are common, and shoe companies have embraced the big toe/wide foot phenomenon by providing runners and walkers shoes that are wider in the toe and foot area. “A lot of people come in looking for shoes for wide feet,” says Luke, who added that the Jus’ Running staff can recommend brands known to accommodate a wider toe box area. Jus’ Running also provides double wides as an option – basically an extra-wide running shoe. Runners and walkers with narrow feet will need a shoe with a more narrow foot base and toe base area. Make sure you are fitted properly so a shoe expert can find the you the proper brand of shoe to avoid discomfort. Common buzz words in the shoe industry are overpronation and supination. Overpronation is when your arches roll inward or downward when walking, often referred to as flat feet. For this type of runner or walker, a stability shoe with arch support is recommended to help avoid injuries. Supination is the opposite: Your foot rolls outward when you walk or run. Luke recommends a neutral shoe for this type of running or walking, since you will not be needing much arch support. However it is recommended you have additional support on the inside of your foot. 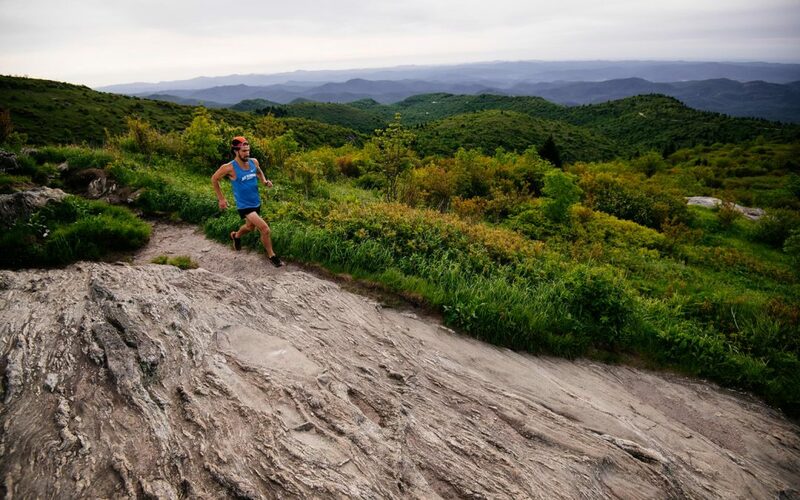 Here in the Blue Ridge Mountains, trail running is very popular, and Asheville and its surrounding areas offer some of the most beautiful and scenic runs in North Carolina. There are three types of trail running shoes: Light Trail, Rugged Trail, and Off Trail. Light trail shoes are designed for relatively uniform surfaces, such as gravel paths and rolling hills. They provide modest protection from rocks and roots, stable foot placement and offer traction on packed soil. Rugged trail shoes are for running on hiking trails and cover the broadest spectrum of terrain. They may include toe guards and hidden plates underfoot for protection from roots and rocks, and a strong midsole cushion to absorb footfalls during steep descents and hard landings on rock. These shoes usually have diverse lug patterns for better grip and stopping power, and some shoes will have grippier rubber for wet rock and wood surfaces. If you’d rather run off the beaten path, then an off-trail running shoe is for you. Off trail shoes offer even more structure and waterproof features, such as polyurethane foam midsoles rather than the EVA foam midsoles found in most rugged-trail shoes. Their structure will be stouter and offer more durability and support. Researching online is a great way to start finding the perfect running shoe, but ultimately you should visit a professional running store and speak with a shoe expert. Having someone look at the way you walk and/or run – and ask the right questions – will help you get on the right path to running and help avoid injuries in the future. How do you know you’re ready for a new shoe? You’ll feel it in your joints, and your shoe feels less “cushiony.” It varies on the person wearing the shoe, their foot strike and the type of shoe, but typical rule of thumb is 200-400 miles total. So, rule #1: Don’t hold off. If you think you’re due for a new running or walking shoe, get to a running shoe store and get fitted by an expert. Your knees will thank you. Rule #2: Don’t skimp on your running shoe. It’s worth your time to do the research and worth the money to find a shoe with the right support. Don’t believe your friends when they tell you they run just fine in Sketchers. They probably only run when chased. Rule #3: Talk to a staff person if you’re just starting out. They’ll have great nutrition tips, trail recommendations and advice; all things you can’t get from the Internet. Rule #4: Bring in your old shoes. If you liked your previous shoes, bring them in so a shoe expert can either find you the same ones or a similar type of shoe. Now go get your shoes. And go for a run! We hope to see you on the trails. Asheville resident Luke Paulson is a professional runner, coach and regular Maggot who works and trains with the Jus’ Running crew in Asheville, NC. He was recently featured in Trail Running Magazine’s “Best Trail Towns” September/October issue, photographed by Adventure and Lifestyle Photographer Andy Wickstrom. (Andy is an Asheville-based photographer. Check out his website here.) Here Luke was photographed running Balsam Knob and the Art Loeb Trail. Come say hi to Luke when you stop by our Jus’ Running store on Merrimon Ave. Thanks for the article……great information. Will definitely try to get by and see Luke! Thanks for such an informative review Stephanie. Nothing is more important than a shoe that fits perfect, matches the running gait of the athlete and most importantly, gives the runner confidence. I’m looking at giving the brooks caldera a run through next. Good luck with the new Brooks and with the running! Thank you for the feedback and for reading the blog.